"THE BEST IN PUBLIC RELATIONS FOR PUBLISHERS AND AUTHORS"
Availability: Nationwide by telephone. Travel by arrangement. Lola, this is what its like. Welcome aboard to the devil and rocknroll! Bono said to his stylist Lola Cashman after he hired her to work for the band. And this phrase might also serve well as an epigram and introduction to Lola Cashmans Inside the Zoo With U2: My Life With the World's Biggest Rock Band (Trafalgar Square Books, $24.95, April 2004): an intimate, behind-the-scenes chronicle of life with the groundbreaking Irish rock band. Cashman, who now lives in London, was one of the worlds leading stylist and image-makers, who has worked with stars including George Michael and the Pet Shop Boys, and with such doyens of the art world as David Bailey and Stephen Frears. For more than two decades, U2 has been at the vanguard of rock music and is currently the worlds pre-eminent rock band. Few groups have had such an impact or as loyal a following. Lola Cashman is one of the few ever to have been allowed into the inner sanctum of the U2 entourage. Hired by Bono to completely revamp the bands image, she came away with a rare insiders perspective. Lola Cashman was the very first stylist to make this previously unkempt lot look as good as they sounded, and here she tells her story. Her insights into the people that make up the U2 circus are just as interesting as the nuggets of rock posturing she divulges. Whether its all true or not is unimportant, as you get some great rock n roll stories, a tantalising peek backstage, and the chance to revel in some classic Bono-isms. Die-hard U2 fans may despair to learn of Bonos paranoia about his weight and height, which leave him looking surprisingly vulnerable. But ultimately, everyone with an interest in the pomp and theatrics of rock music will love this book. Rock on! Cashmans journey began in the East End of London, working in her father's illegal gambling dens where she served tea and sandwiches to some of England's most notorious gangsters. After a stint in the fashion industry, styling commercials and fashion shoots, she began working for U2 in the late 80s during the Joshua Tree tour. Cashmans recollections reveals how important image was to the success of the band, something Bono was very aware of, to the point of meeting with her regularly to discuss the bands fashion priorities. But even though Cashman consulted regularly with Bono, she says it was by observing the band in their most personal and candid moments that she grew to understand their personalities, and, in turn, created an image that reflected this. Cashmans book, far from being malicious gossip, winds up admiring Bono, for his music, of course, but also for his passion for justice which led him to be nominated for the Nobel peace prize. 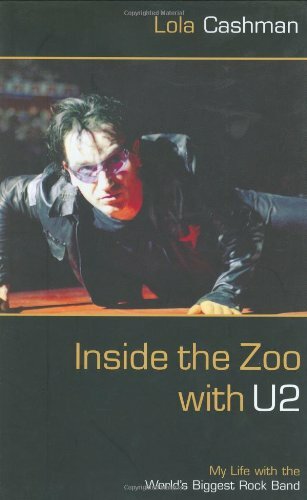 A fun, informal romp through the world of U2, fashion and rocknroll, the book Inside the Zoo With U2 by Lola Cashman is available at bookstores nationwide or by calling the publisher at 800.423.4525. Further information is available at Trafalgar Square Books. With U2 planning to release a new as yet untitled album in the latter half of 2004, U2 fans appetites for dish like this should be freshly whetted. We would like to hear from you if you plan to mention or review the book in your publication. Clippings would be appreciated. Mail to: Susannah Greenberg Public Relations, 2166 Broadway, 9-E, New York, NY 10024. Thank you.